CAD/CAM - Computer-Aided Design and Computer-Aided Manufacturing uses CAD or CAM technology to provide a range of dental restorations including: crowns, crown lays, veneers, inlays and onlays, fixed bridges, dental implant restorations and orthodontic appliances. 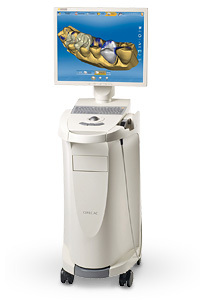 CEREC is a software for dental restoration that allows to produce an indirect ceramic dental restoration using a variety of computer assisted technologies, including 3D photography and CAD/CAM. With CEREC, teeth can be restored in a single sitting with te patient, rather than the multilple sittings required with earlier techniquies. Additionally, with the latest software and hardware updates, crowns, veneers, onlays and inlays can be prepared, using different types of ceramic material. Computed technology (CT) is used particularly to plan dental implants. Special designed CBCT (Cone Beam CT) scanners are used, which produce adequate imaging with a stated tenfold reduction in radiation. Cone beam computed tomography (cone beam) CBCT is a radiographic technique developed for the field of maxillofacial surgery. Its main feature consists in the fact that provides a digital reconstruction in three dimensions with reduced radiation. Computed tomography is used especially for implant-prosthetic planning.